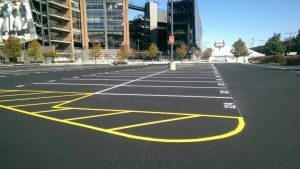 Asphalt pavement remains a popular choice for roadways and parking lots due to its economical costs and attractive appearance. Furthermore, properly installed asphalt pavement should have a life expectancy of 25 years or more if it receives timely repairs and proactive maintenance. Eventually, all asphalt pavements are going to need more than one or two small cracks repaired. Knowing when to sealcoat, resurface or repave can help you budget appropriately, and over the life of your pavement, you can save a significant amount of money. Sealcoating should be applied early in the life of your asphalt pavement. Your asphalt contractor can advise you on the exact schedule you need to follow, but because the pavement needs to cure first, sealcoating is not normally applied until at least 90 days after the asphalt is installed. Depending on the traffic and loads to which your asphalt pavement is subjected, you will need to have fresh sealcoating applied every 18 to 36 months. Asphalt sealcoating is your pavement’s first line of defense against deicing chemicals, automotive fluids and UV radiation. If the color of your asphalt pavement has faded, sealcoating can bring back the deep, rich color of newly applied asphalt. It can also smooth out minor surface imperfections to give the pavement a more even appearance. However, because sealcoating cannot fill large breaks in the pavement, potholes or cracks should be repaired before sealcoating is applied. When you have your asphalt pavement resurfaced, the contractor will apply a new layer of asphalt directly on top of existing pavement. Cracks or potholes will need to be repaired first to prevent the deterioration from continuing beneath the surface and to prevent damages from “telegraphing” through. In addition, the pavement’s supporting foundation should be in good condition. Resurfacing can be appropriate if the pavement has damage over 25 percent to 50 percent of its surface. Repaving involves tearing out the old pavement, rebuilding the foundation and installing new asphalt. It is the most costly option as well as the one that will require the most time to complete. If the surface or the foundation has suffered extensive damage, repaving may be your only option.